This activity involves carrying out a route on foot with specific equipment, going down the beds of rivers, torrents and canyons, overcoming natural obstacles by using different techniques common to both mountaineering and spelunking. this is a chance to discover landscapes that can only be seen from this perspective. Canyoning is an activity that is suitable for all people in normal physical condition, even though there are several degrees of difficulty based on the profile of the client. This activity may be carried out year-round, and it is very much in demand among many groups. The Valencia Region, owing to its mountainous terrain and extensive network of waterways, offers a large number of canyons of all types, both wet and dry, in which you may practice this sport, keeping in mind that you must respect the environment and applicable legislation at all times. 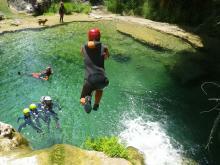 The Valencian Spelunking Federation (Federación valenciana de espeleología) offers further information on canyoning in the Valencia Region.